Review: "Funeral Tears: Your Life My Death" - Sea of Tranquility - The Web Destination for Progressive Music! 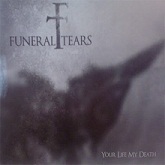 Funeral Tears is a Russian act that was founded in 2007. This is the creation of solitary artist Nikolay Seredov. This man has also been involved in various death and black metal bands before. Everything about this album is painted in shades of grey, just like the artwork throughout the booklet. This album clocks in at over fifty minutes and contains only five songs. Funeral doom is the musical genre that Nikolay prefers and he does a great job on Your Life My Death. The songwriting is very good; the same goes for his musicianship. I can't really decipher his words due to the deep growls he has, but those can only express unhappy themes. When he used clean vocals, the lyrics are in his native tongue. Nonetheless, you can feel the deep sense of melancholy and the depressive vibe often connected to funeral doom. The songs are mostly built on a similar pattern and used ambient keyboards, distorted vs. clean guitars, strong bass and pounding drums. The pace is slow and unvaried, while the compositions possess a definite mesmerizing touch. Just a few samplings were used on this recording. Those are natural elements like rain, wind and thunder. All the songs off the track list are worth mentioning, because they are well written pieces of melodious funeral doom. Your Life My Death remains a heavily emotional release from the first note to the last breath.